Note the 2 Secret Service agents, with hands together and lowered, standing directly behind George W. Bush. got in or out unless given the green light by the Secret Service. At last count, at least 5 VIP families received the “special note” at the D.C. memorial service for George H.W. Bush. That would be the Bush family (George W., Laura and Jeb), the Clintons (Hillary and Bill), the Obamas (Michelle and Barack), the Bidens (Joe and Jill) and the Pences (Mike and Karen). Question # 1: Why did the sender make sure the wives also received the ominous message? Whoever is responsible for this psyop, it’s clear that every part of this drama was fastidiously choreographed for maximum effect. Question #2: Why, specifically, did those 5 power families receive the secret message? Bush, Clinton, Obama, Biden and Pence? Such a plot to capture the attention of both husband and wife was quite well planned out. 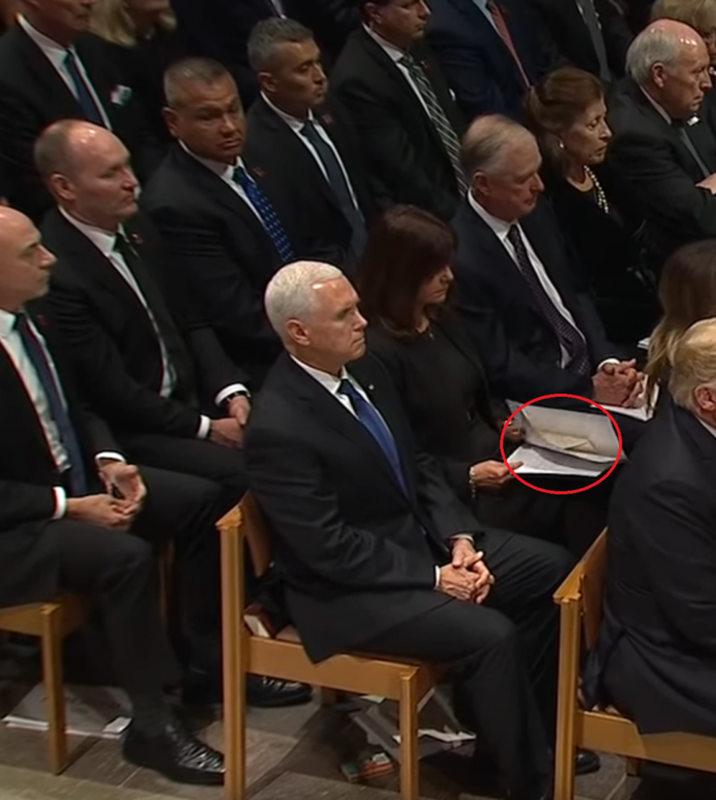 Handing the note to the Bush family at the exact time that the casket was passing them also occurred with highly calculated significance. 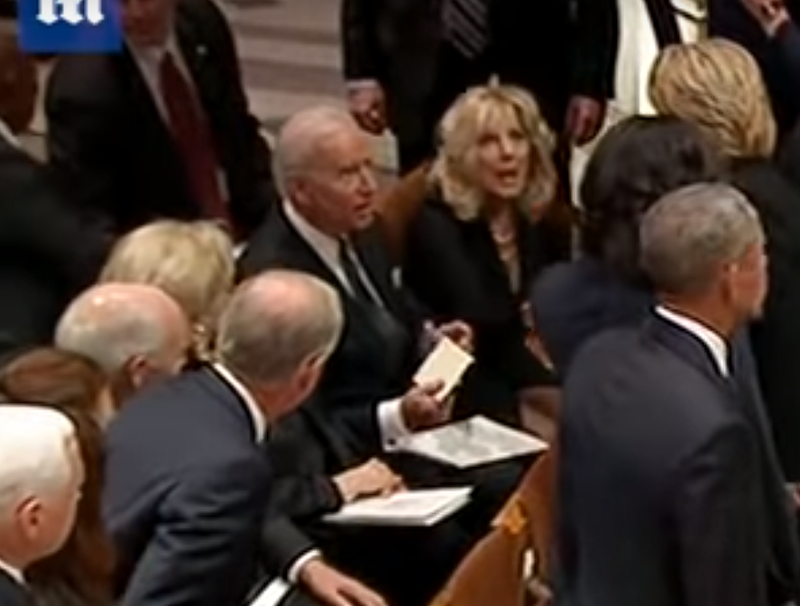 There were many other Deep State dignitaries and VIP globalists at the same venue during that funeral service. There’s no indication, however, that anyone else present got the “special note”. Although this may not be correct. It’s critical to understand the key aspects of the context in which this explosive drama played out. 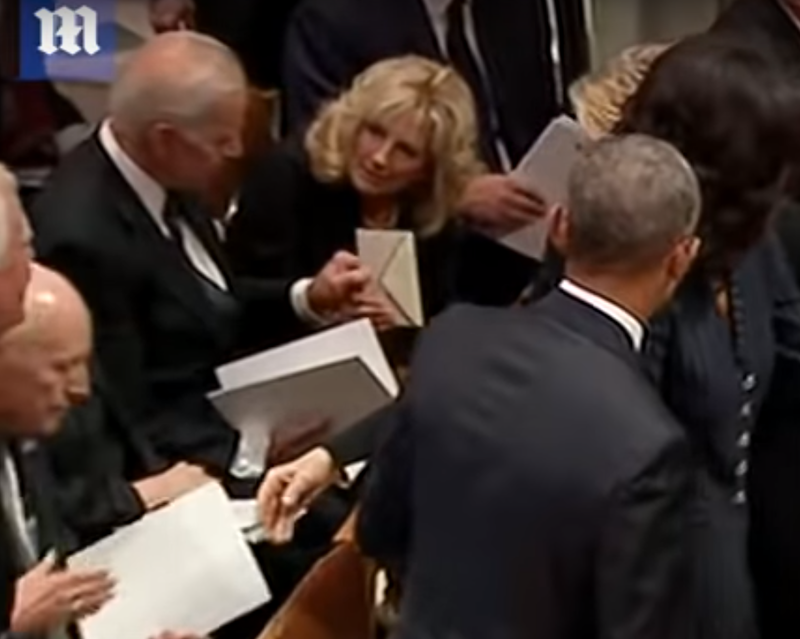 Five U.S. presidents and vice presidents received a special envelope during the most MSM-hyped and misrepresentative memorial service in our lifetime. How does that happen except with extremely purposeful design?! KEY POINT: President George H.W. Bush was neither “gentle” nor “kind” to his nation as the MSM eulogized him. Not only was he the pivotal rogue CIA operative in Dallas during the assassination of President John F. Kennedy, he was also the prime mover behind the Oklahoma City Bombing because of the Savings and Loan scandal fallout. The Bush Crime Syndicate was also the key architect and ‘American’ co-conspirator that executed the state-sponsored, false flag terrorist attacks on September 11, 2001, as well as the well-orchestrated CIA-coordinated cover-up. 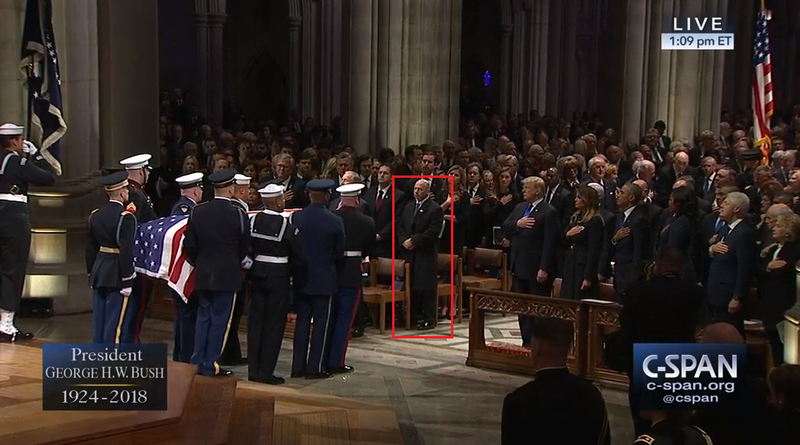 In spite of the ongoing “funeral service of the century”, a videographer(s) was present at all the perfect locations to capture the videos of the very moment when the notes were being handled and opened. The video footage was especially shot in such a manner so as to catch the reactions of each VIP and their spouses, whether they saw the contents or not. Next, the various videos were then disseminated to various YouTube channels to make sure they were expeditiously uploaded and easily viewed on the Internet. 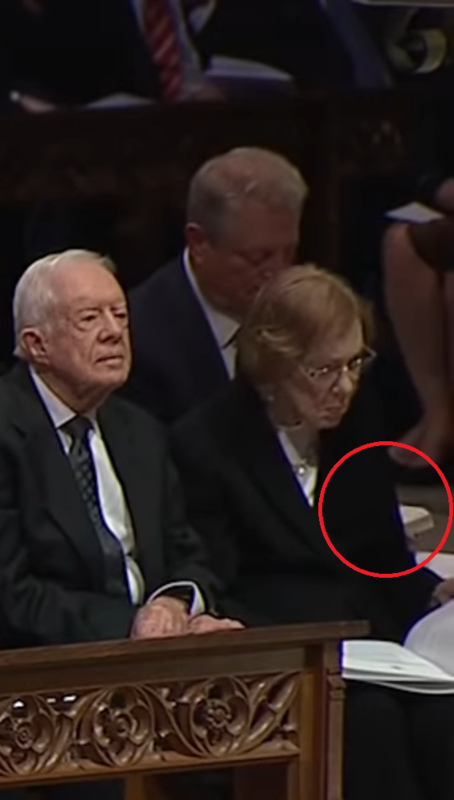 First of all, there’s no other event in U.S. history that even remotely comes close to this stunning series of envelope incidents RIGHT SMACK IN THE MIDDLE OF AN EX-PRESIDENT’S FUNERAL. Therefore, it can be stated with absolute certainty that something very BIG happened, and that something even BIGGER is in the offing. Everything points to the high likelihood that President Trump put these political dynasties and crime families on notice during the Bush state funeral. Whatever they saw, or when they heard about the contents of the envelope, each individual was floored in ways that were both obvious and veiled. The Bush family reacted in horror, especially Jeb Bush. Laura was quite disgusted as well, although W. appeared to know it was coming. Hillary Clinton was her usual defiant self; so was Michelle Obama. Barack couldn’t hide his fear (although he tried very hard to) as would be expected from the former Coward-in -Chief. As for the Bidens, they were both visibly startled by the whole affair, reflecting a sincere disbelief that such a thing could even happen … … … during a presidential state funeral, no less! As for the Pences, the camera never really caught them at the point of revelation so not much can be said about their reaction. What’s of paramount importance here is that all of these political power-brokers represent the New World Order globalist cabal. None of them ever saw a war they didn’t like. Most significantly is that this happened to them in a highly symbolic venue in the nation’s capital. Deep State is supposed to have complete control over such power places as the National Cathedral in Washington, D.C. In light of these unique circumstances, it’s fair to say that Trump threw down the gauntlet. And, that he did so in a manner that the whole world could see it. This key point will profoundly inform the rest of the analysis. The reaction will be fierce! 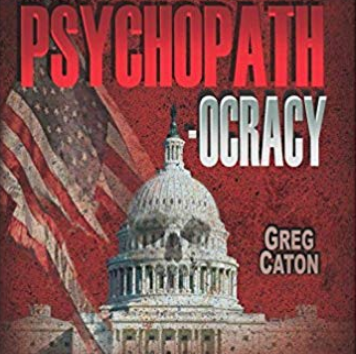 It’s only common sense that when powerful members of the psychopathocracy have been threatened, the reaction will be decisive and dangerous, destructive and deadly. That’s exactly where we are today in America. The psychopaths who have led this nation over decades have all been found out. The Patriot Movement has completely exposed them for being the traitors that they truly are. In fact, so many acts of high treason have been uncovered and detailed for all to see that the ruling cabal has these notorious crime families commit even more crimes to cover up their previous crime sprees. That’s just how deep this multi-decade criminal conspiracy going back to the assassination of President John F. Kennedy really is. As a result, these psychopaths are exceedingly desperate. Hence, they are guaranteed to react like cornered rats. In the process of trying to escape from the jaws of death after their military tribunals, there is simply nothing that they will not do. In point of fact, there is a window of time that is quickly closing for both sides of this fight to the death. However, neither side wants to act first for fear of being perceived as the aggressor. As a result, the thoroughly corrupt Mueller investigation proceeds forthwith as though indicting the POTUS will secure their victory. The NWO criminal cabal has ignored the great probability that posing such a reckless threat will only embolden Trump to run again sure of a victory. He will never allow himself to be put in the position of being falsely prosecuted by a hardened gang of Deep State villains. Because of their perilous deficit of understanding, the globalists are still working hard to set up Trump at every turn. By incorrectly assessing their true predicament, the agents of Deep State execute their schemes as though no one is watching and they still expect outcomes that might have occurred pre Internet. “The Envelope Affair” did take place immediately following the worst attack on U.S. soil since the state-sponsored, false flag terrorist attacks staged on 9/11/01. That would be the DEW attacks and pyro-terrorism perpetrated against the people of California throughout the month of November. These geoengineered firestorms and Directed Energy Weapon attacks on the state of California not only devastated large swaths of territory, thousands were ruthlessly killed many of whose deaths have not even been acknowledged. The distinguishing aspect of these cowardly attacks on innocent civilians is that they were carried out, by and large, in red counties and conservative strongholds. Heavily forested parts of northern California have been subjected to these manufactured wildfire seasons for years now. Only the past 2 years have seen 4 separate wildfire seasons that have been truly apocalyptic. Whereas the authorities say only 88 people died, direct evidence has shown that hundreds have died. The final death toll for November 2018 is certainly going to be in the thousands. Exactly how many good people were murdered we don’t know, but you can be sure that President Trump knows. He also saw the utter devastation himself upon his tour with Governor Jerry Brown—a highly compromised co-conspirator. It appears that Trump cannot speak to this catastrophe the same way that he could not speak to the Mandalay Bay massacre staged in Las Vegas by the globalists. Therefore, it may be that the coming storm will be a direct result of this California mass murder and malicious destruction of property statewide. 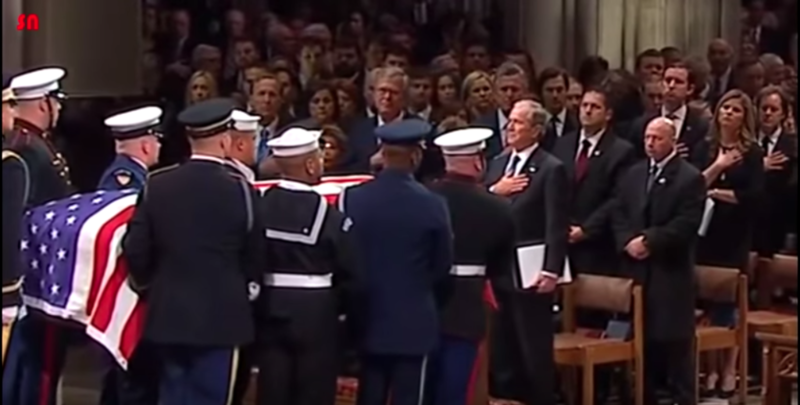 How and when exactly the secret notes were disseminated at the Bush funeral has been captured by video. Each video tells a story that is quite incredible. The reactions of each VIP after seeing the contents reflect something that is both shocking and compelling for each recipient. 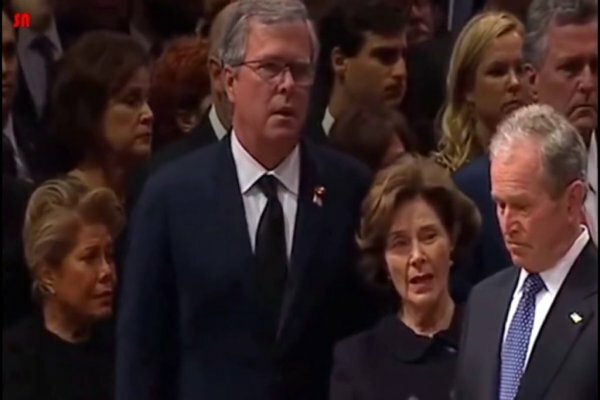 What in the world really happened at the Bush funeral? Quite frankly, we don’ know what happened at the funeral. The content of those notes is anyone’s guess. What we do know is that each person who looked at the contents immediately knew what they saw was real and very disturbing. With this critical understanding, it’s quite likely that all of the recipients received the very same note. And, that it was designed to have maximum impact, which it did. Therefore, what can be said with utmost confidence is that the gauntlet has been thrown down by one side against the other. And, that what happened in that cathedral is perhaps the beginning of the end of life inside the Beltway as we — and THEY — know it. In other words, these shared notes will prove to be the most highly consequential happening in American government as they have already triggered a chain reaction of cathartic events that cannot be stopped. There is no more apt expression to describe where the nation is at this critical moment in our history than: ‘The writing is on the wall’. 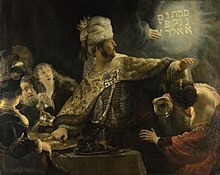 From the Biblical story in Daniel 5, where, during a feast held by King Belshazzar, a hand suddenly appears and writes on a wall the following Aramaic words: מְנֵא מְנֵא תְּקֵל וּפַרְסִין‎ (mənē mənē təqēl ūp̄arsīn, “numbered, numbered, weighed, and they are divided”) (Daniel 5:25). Daniel interprets the words as pointing to the downfall of the Babylonian Empire. Since the United States of America is sometimes thought to be the modern-day “Mystery of Babylon” in the Book of Revelation within various religious circles, this particular metaphor may have great meaning beyond anyone’s imagination. METAPHOR MESSAGE: The whole political order is about to change as the old way of doing business is no longer acceptable in Washington, D.C. It’s entirely true that the current order marked by pervasive lawlessness, serial criminality and institutionalized corruption is the very same as that established by Black Babylonian Brotherhood of ancient lore. Martial Law, Military Tribunals or Both? Because of the rapidly unfolding events in the nation’s capital, things are about to get very hairy indeed (as well as precarious) for the American people. The “new normal” of today cannot go on much longer, particularly because it quickly morphs into an even newer normal by the month, which is all the more outrageous and unacceptable. “It’s coming apart at the seams” depicts the sense that everyone now has these days, and yet the tension just keeps intensifying. Given this stark reality, the Republic will soon experience a house cleaning like none before. Whether this “changing of the guard” is carried out by military tribunals or martial law remains or both remains to be seen. However, there is great certainty about the absolute necessity of forming military tribunals that cannot be dismissed or ignored. 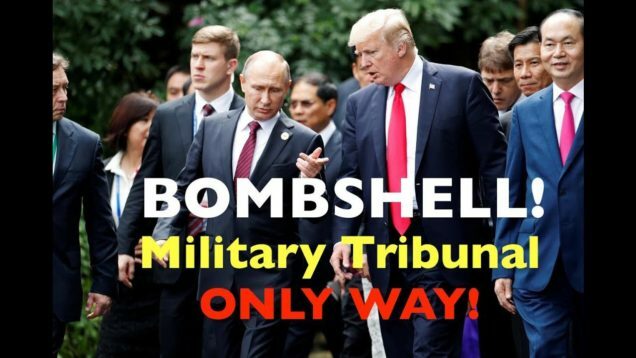 Military tribunals are especially required to prosecute the Deep State criminals, rogue Intel & SS agents and Shadow Government perps who are conducting a soft coup against the POTUS. But why military tribunals? Because those traitors practically own and operate the U.S. Criminal Justice System, that’s why! Given the true depth and breadth of the swamp “inside the Beltway”, it’s clear to the Patriot Movement that the only solution is a military one since the swamp creatures simply will not leave without a fight. That’s even after the swamp is drained, the perps will put up a fierce fight to save themselves and their satanic way of life. As for martial law, it’s now evident that the Democrat Party can never again be permitted to hold the reins of power in the USA. Their collective acts of treason and individual acts of sedition are unprecedented in U.S. history. In point of fact, there are so many stone-cold traitors among them that the only way forward may be a declaration of martial law followed by military tribunals to successfully weed them out. Что на самом деле произошло на похоронах Буша? Что за таинственные запечатанные конверты получили лидеры «Глубокого государства» США, на похоронах Джорджа Буша — старшего? После того, как Хиллари Клинтон открыла свою программную брошюру на похоронах Джорджа Буша-старшего, на ее колени упал конверт. Что было в этом конверте? Некоторые думают, что он, возможно, передал ему записку. Затем Буш предположительно передал его своей жене Лоре, и она показала это Джебу. Что за послание получили элиты США, и от кого?